My oldest daughter is an Art teacher at a local charter school. For years she has run the after school art program as a volunteer. When the Jr. High needed to hire an art teacher, they asked her first. This semester, she had them do self portraits and asked if I would come in and help. We talked about proportion, basic facial placement of features. Then we discussed value and the importance of drawing what you see, not what you think you see. I taught them to turn their pictures upside down to check for mistakes and think in terms of shapes working large to small. Talked too about the angle of the line, it's placement on the surface and it's length. All in all, it was fun and I hope informative for the kids. Here are the two portraits I ended up doing in class. Colin Morgan has such an interesting face. Kim, these are stunning! What a great opportunity for the students. 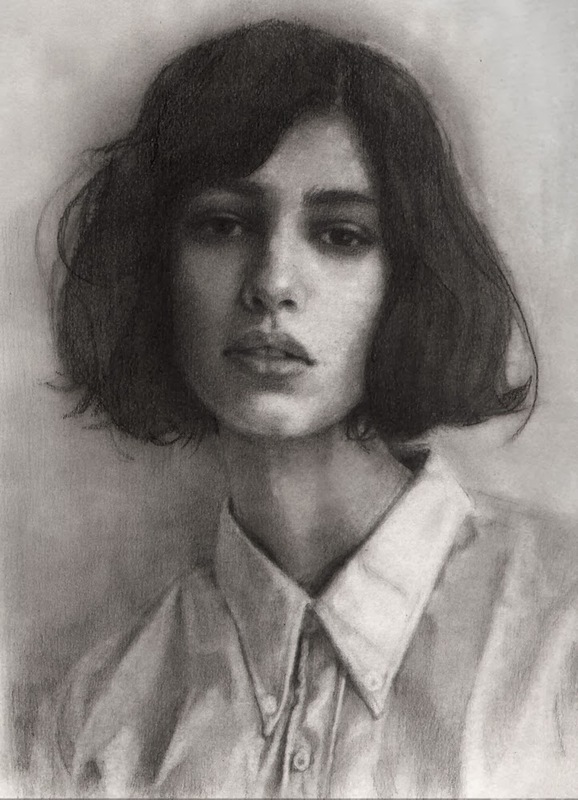 It is always helpful for people to learn portrait basics, especially things like how the features on the face align...how eyes aren't really way above the ears, etc. I am sure you did an amazing job, and those students who want to will be able to make great progress following your tips! Wow, really good work. How is it that you can make a young teenager look like an immortal elf? Thanks Amy. I was actually amazed how many lacked the confidence to draw an oval. I finally had to say to them that the words, "can't" and "bad" were off limits. "Try" was all I wanted. Once I convinced them to use a light touch with the pencil and had them repeat, "there are NO mistakes, just learning", progress was made. Thanks Brian. How's your thesis coming? Don't forget the brushes! Great work, of course! Interesting note: one of your daughter's (and your) former students just joined my class. 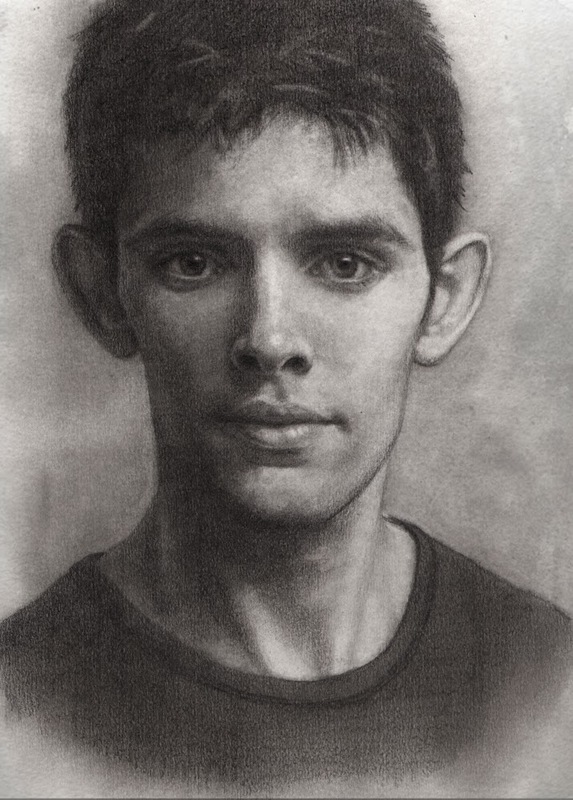 I looked through her sketchbook, and saw her "Merlin" drawing. It was far better than the other things in her sketchbook -- evidence of your great teaching. Lest I offend, let me clarify. Her sketchbook contained mostly faces and they were not class assignments (I asked). They showed evidence of plenty of enthusiasm, but lack of true observation in terms of placement and proportion. Her drawing of "Merlin," however, was different with fairly accurate placement and proportion, with better shading -- results of your instruction. Wow John! You made my day. Thank you so much for sharing this with me. I'm sure she will greatly improve under your tutelage. Lucky kids to have such expert instruction. Interesting that they lacked confidence to draw an oval. Do you think it shows that art education (practical) is lacking? Interesting. Thank you Kim and Monika. Always appreciate the positive comments.